Madeline DeFrees published two chapbooks and eight full-length poetry collections, including Spectral Waves (Copper Canyon, 2006) and Blue Dusk (Copper Canyon, 2001), which was awarded the 2002 Lenore Marshall Poetry Prize. Both books received Washington State Book Awards (2002 and 2007). She also published essays, reviews and short stories, as well as two nonfiction books about convent life. Ms. DeFrees spent 38 years as a nun with the Catholic Congregation of Sisters of the Holy Names of Jesus and Mary. 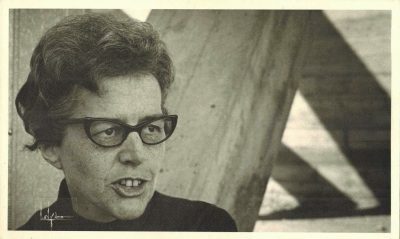 She entered the community after high school and later requested release because, in her words, “religious life and poetry both demand an absolute commitment.” As Sister Mary Gilbert, Ms. DeFrees earned a BA in English from Marylhurst College (1948) and an MA in Journalism from the University of Oregon (1951). She studied poetry briefly with Karl Shapiro, Robert Fitzgerald, and John Berryman. She taught at Holy Names College in Spokane from 1950 to 1967, and resumed her baptismal name before going on to teach at the University of Montana from 1967 to 1979. From 1979 to 1985, she taught at the University of Massachusetts, Amherst. After she retired in 1985, Ms. DeFrees held residencies at Bucknell University, Eastern Washington University, and Wichita State University. She received fellowships in poetry from the John Simon Guggenheim Foundation and the National Endowment for the Arts. In 2008, the University of Washington awarded her the Maxine Cushing Gray Visiting Writers Fellowship. She passed away on November 11, 2015. She was 95. Author photo courtesy of Lee Nye, 1967.